i. Punjab has become the first state in India to issue Soil Health Cards (SHCs), a Union Government initiative to all farmers in the state. ii. In this regard, every district of state has been assigned mobile soil testing lab. These labs will take soil sample from every farm and issue a digitalised soil health details. iii. Presently, state government has 66 such laboratories and has capability to test 3.5 lakh soil samples annually. State government also has made mandatory for these labs to check soil health on quarterly basis. iv. It will help farmers in maintaining the balanced health structure of the soil and educate them to use right quantity of fertilisers in order to prevent soil from becoming arid. 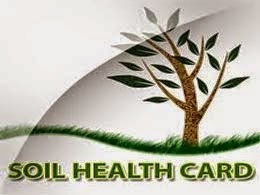 v. Prime Minister Narendra Modi had formally launched the nationwide ‘Soil Health Card’ Scheme in Februrary 2015 in Suratgarh, Rajasthan. i. The government will sell its 10 per cent stake in blue-chip Indian Oil Corporation (IOC) and 5 per cent in power producer NTPC to mop up about Rs 13,600 crore in this fiscal’s first disinvestment approval. ii. The approvals are part of Rs 41,000 crore disinvestment target for the current financial year. iii. Buoyed by diesel price deregulation, the government is looking at selling stake in Indian’s largest fuel retailer IOC for the second time in 13 months. Sale of 24.27 crore shares, or 10 per cent stake, in IOC would mop up close to Rs 8,000 crore at current market price. iv. Decision in this regard was taken by Union Cabinet Meeting chaired by Prime Minister Narendra Modi in New Delhi. v. Currently, Union government holds 74.96 per cent in NTPC and 68.57 per cent in IOC. ii. The government faced questions from its own members and allies over whether the Bill's provisions could be used by corporates to harass common people. iii. The Bill was passed by a voice vote, with Minister of State for Finance Jayant Sinha insisting that it would boost the "integrity of financial system" and not lead to the harassment of the common man. i. The Reserve Bank is planning to set up an information technology wing to face the rising challenges coming from the cyber world. ii. It can be noted that online frauds in the financial sector have been on the rise and hundreds of gullible people have been defrauded by crooks, using their stolen credit and debit card information. iii. The cyber thieves have even been using RBI logos to send out mails to cheat customers. i. India has met only four of ten health targets under the Millenium Development Goals (MDG). ii. The report finds that globally, life expectancy at birth has increased by six years for both men and women since 1990.
iii. Since 1990, child deaths have almost halved — falling from an estimated 90 deaths per 1000 live births to 46 deaths per 1000 live births in 2013. Yet the world will not achieve the MDG target of reducing the death rate by two-thirds. iv. In India, life expectancy grew by eight years between 1990 and 2013. While India has sharply reduced its infant mortality between 2000 and 2013, it still contributes for the most infant deaths globally. Non-communicable diseases are the top killers, followed by communicable diseases and injuries. i. Deflationary pressure continued for the sixth month in a row with inflation dropping to a new low of (-)2.65 per cent in April, mainly on account of decline in prices of fuel and manufactured items even as food prices increased. ii. Inflation, as measured on the Wholesale Price Index (WPI), has been in the negative zone since November, 2014.
iii. The deflationary trend has bolstered the case for a rate cut by the Reserve Bank, as retail inflation has also eased and industrial production is down.